Leatherman Multi-Tools are one of the most versatile tools available. 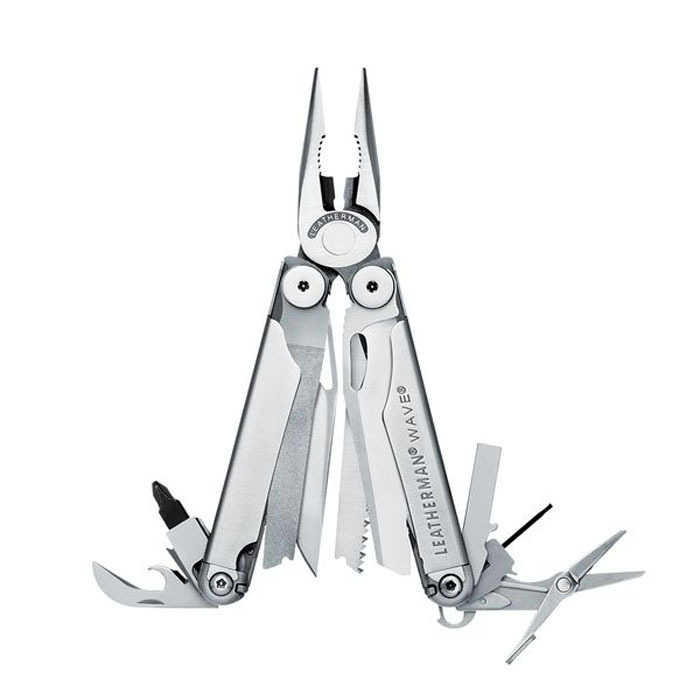 The Leatherman Wave multi-tool is the most popular model, made famous by its outside-accessible blades that can be deployed with just one hand. Redesigned in 2004, the new Wave features larger knives, stronger pliers, longer wire cutters, and all-locking blades. Perfect for any job, adventure, or everyday task, the Wave multi-tool is an international best-seller. Stainless steel and backed by a 25-year warranty. Tools include: Needlenose pliers, regular pliers, hard-wire cutters, wire cutters, wire stripper, 420HC knife, 420HC serrated knife, saw, spring-action scissors, ruler (8in), can opener, bottle opener, wood/metal file, diamond-coated file, large bit driver, medium screwdriver. Comes with sheath.